As demands on the medical industry continue to increase, time becomes an even more precious resource. And to accommodate the on-the-go requirements for education in this environment, many are turning to mobile devices. From physicians to nurses and more, mLearning is changing the way healthcare professionals learn and access important information. 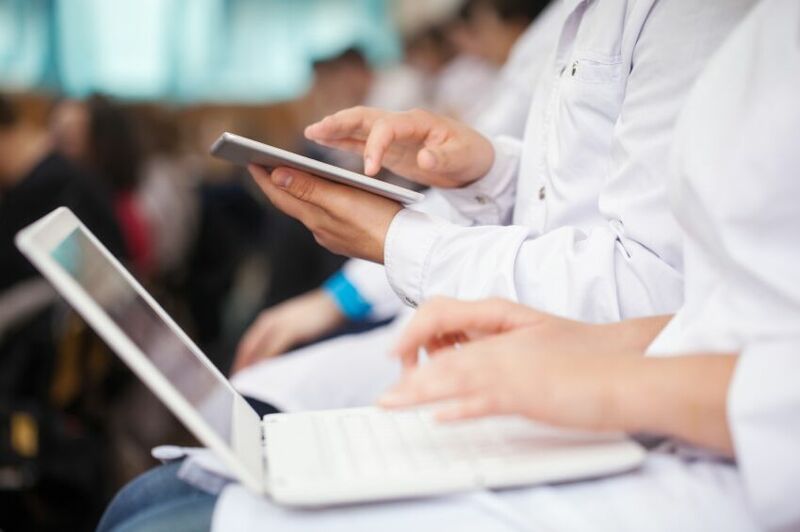 In this post, we’ll look at mLearning growth within the medical industry and the trends that indicate where the future of healthcare training is headed. Mobile continuing medical education (CME) is an increasingly popular format for medical professionals who are required by state law to attain on-going CME credits. 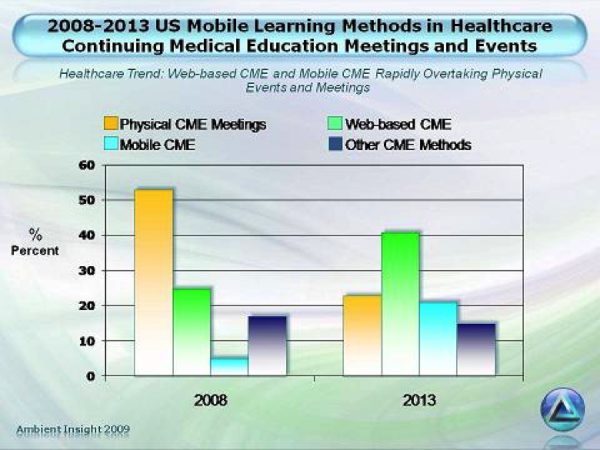 In fact, research from Ambient Insight shows that between 2008-2013, mobile CME grew from about 5% to 21%. Since many people are physically attached to their smartphones at all times, it’s no surprise that this delivery format is becoming increasingly popular. Apps and audio recordings that enable mLearning to take place in the car on the commute home, during an exercise session—anywhere, really—are accommodating the needs of busy medical professionals who need greater flexibility. But there has also been an increase in mobile emergency medical decision support, clinical decision support, and medical reference. These mobile resources provide accurate data when time can’t be spared and provide a breadth and depth of information within a few quick clicks. These tools that provide contextual performance support (specifically to emergency personnel) can be the difference between life and death in some instances. For example: Georgia Tech Research Institute uses a free mobile resource called the “Chemical Companion” that has detailed information on the 130 most common hazardous materials—which is used to determine what gear is required, contamination procedures, and more. The rapid growth of mLearning and mobile resources in the medical field hasn’t gone unnoticed, either. One research firm predicts that the mLearning market will grow to $37.6B by 2020. Other medical professionals are using technology-aided resources to help them perform procedures and administer proper care. This just-in-time format of learning is especially helping doctors in other countries with limited access to information. For example, one doctor in the Democratic Republic of Congo performed a life-saving surgery thanks to text message instruction. While this isn’t technically mLearning, it still gets at the spirit of JIT learning in the field. As healthcare continues to change, it’s important for technology to evolve along with it—and education is only a small piece of that puzzle. However, digital acceleration is only helping those who work in the field keep up with the pace of quick-moving changes. The bottom line: In the medical field, time is an extremely precious resource—so when technology-aided tools like mLearning can improve efficiency while maintaining a high level of quality—everyone wins. As more people realize the full potential of mLearning and mobile medical tools, we can expect to see continued growth within this market. This is good news for both providers and patients, who both benefit.